Brilliant Multiple College (BMC) was established in 2000 A.D. It offers undergraduate level programs in Bachelors in Business studies and Bachelors in Hotel Management and graduate level programs in Masters in Business Studies. All of these programs offered by the college are affiliated from Tribhuwan University. Being a community institution, Brilliant Multiple College aims to provide opportunity for all to achieve the excellence in academic in a very low cost. The vision of the college is to provide quality education to their students. 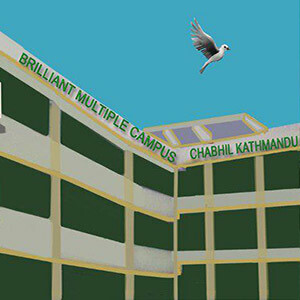 Brilliant Multiple College college is located in Sifal, Chabahil, Kathmandu. There are 13 members in Board of director. Mr. Badri Nath Shrestha is board chairman and Ms. Radhadevi Shrestha is Vice Board Chairman. Along with them there are other reputed personalities involved in the team of Board Members. The college offers Bachelor degree and Master degree in BBS, BHM and MBS.The class is schedule for two shifts. Morning and Day are two shifts available in this college. Morning shift starts from 6-10 AM and Day shift starts from 11-3:30 PM. Enrolling in Bachelor of Business Studies (BBS)? Join Brilliant Multiple Campus and involve in the process of acquiring versatile skills in various areas of business. Here, we have prepared a list of details about the course and the benefits of studying in Brilliant Multiple Campus. Determined to widen your knowledge in the various fields of arts and professionalize in it? Join Bachelor of Arts (BA) at Brilliant Multiple Campus and explore these fields and begin your journey towards the proficiency. Learn more details regarding the course and the college.